When a testator (the person making a will) dies and the contents of his will are revealed, there are some family members who may seek to contest the will for various reasons. In some cases, the will challenge is based on a feeling that the challenger should have received a larger bequest. However, sometimes, a challenge is based on a belief that another person interfered or influenced the testator into making the will he made. Under Florida law, a will is void if it is found to have been procured by fraud, duress, mistake, or undue influence. Two common ways for challenging a will based on the alleged wrongdoing of a third party involve fraud and undue influence. When a court considers a challenge based on undue influence, it considers whether the testator was persuaded, pressured and influenced by another person to the point that the testator was under that person’s complete control, and could not act voluntarily when it came to making the will. If the person challenging the will can show that the person who ended up as the major beneficiary in the will was in a confidential relationship with the testator, and was active in procuring the will, then there is a presumption of undue influence. The beneficiary of the will can then present evidence to show that there was no undue influence. There are some factors that courts look at when a claim of undue influence is made, including how active the beneficiary was in getting the testator to write the will in their favor, and whether the beneficiary asked the testator to make the will, spoke to an attorney on the testator’s behalf, or was present at the signing of the will. There are two kinds of fraud when it comes to challenging a will on the basis of fraud. A will can be challenged if the testator was fraudulently induced into leaving all his property to a person he would not otherwise have left it to. In addition, a will can be challenged if the testator was fraudulently led to believe that he was signing a document that was something other than a will. With fraud, the person challenging the will has to show that the person who tricked the testator into signing a will in his favor made false statements to the testator regarding the will, and that the person did so knowing the statements were false and actually intended that the testator rely on the statements to make the will the testator did. For example, this may occur if one of the children of the testator tells him lies about a sibling in order to get the testator to change a will and make the first child the major beneficiary or disinherit the sibling. When a will is successfully challenged on either fraud or undue influence grounds, the court can rule the will invalid, and the deceased person’s estate is divided as it would have been divided if the person had died without a will. 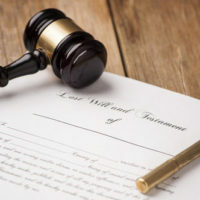 If you are considering changing your will to include a new beneficiary who will take a major share in your estate upon your death, you should consult your own independent attorney to ensure your intent is accurately portrayed in your will, and to give you a better idea of whether or not a challenge can be raised against your will based on undue influence or fraud. For more information on how an experienced estate planning lawyer can help you write your will, call the Millhorn Elder Law Planning Group located in The Villages, Florida today.